Season 8 of the Comprehensive Worldwide Webinar for the NPTE, NPTAE, and PCE! 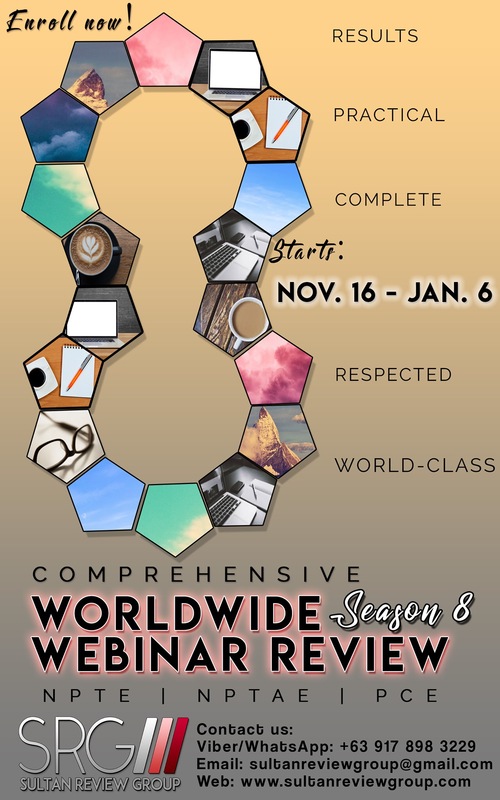 The highly sought-after Worldwide Webinar program for the NPTE, NPTAE, and PCE NOW OPENS its 8th season! Packed with the MOST COMPREHENSIVE lectures from the MOST CREDIBLE and SEASONED LECTURERS in the review industry! The new season of worldwide webinar will start this Nov 16, 2017. Reserve your slots now and join our growing list of NPTE, PCE, and NPTAE passers! 2. Fixed Schedules: Mon-Tues-Thurs-Sat. 6pm (Pacific Time), 9am (Philippine Time), 4-5 hours per session. The fixed schedule develops STRUCTURE of studying among students. 3. Longer lecture hours. 4-5 hours instead of only 2 hours by other webinar reviews. 4. Longer sessions. 30-35 sessions instead of 15-20 sessions by other webinar reviews. 5. The best program ever! The program is tangible to people who are working. Edmond Sultan developed the FIO Program. Developing Foundations, Integration and Outcome-Based Learning (FIO), not just memorization. 6. Better productivity encouraging structured review plus work/life/review balance. NO need to resign! No need for PTO! 8.All review materials/handouts around 2000 pages are FREE. Shall be sent via email a day or two before each webinar session. Previous Entry:5 days left ’til the Season 3 of the Classroom Webinar Review Program for the Feb 2018 PT-OT Licensure Exam! Next Entry:4 days left ’til the Season 3 of the Classroom Webinar Review Program for the Feb 2018 PT-OT Licensure Exam!